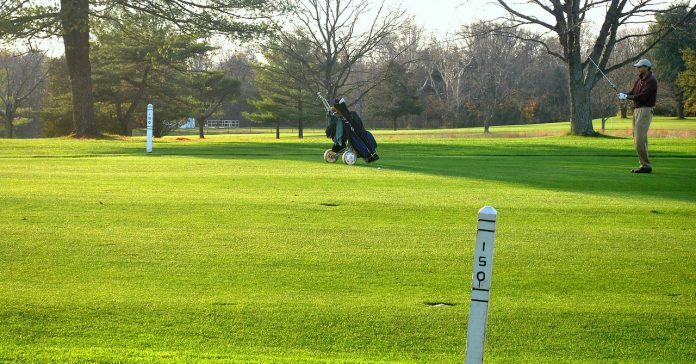 There is nothing more frustrating than hitting the perfect shot than to see if fall short of the green due to wrong choice of club, simply because of misjudging the distance. Though if you have access to a good rangefinder you can get the exact distance and therefore get the perfect club for the job. So, you really can focus on what’s at hand – the actual golf. Below are my top 3 choices for a golf rangefinder with quality and affordability being the things I am looking for the most. 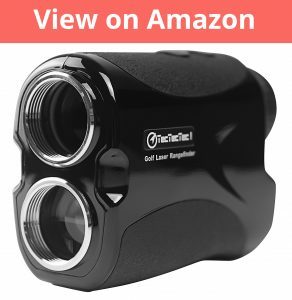 This TecTecTec unit is the one of the best-selling rangefinders out there and that’s no surprise after using it. 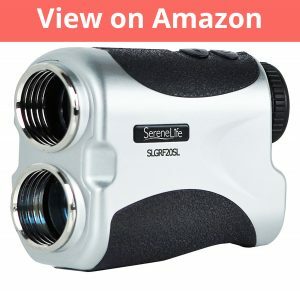 If you are looking for the most accurate or top-notch rangefinder this may not be for you but what this rangefinder does – it does quite well and at a very affordable price. It has the one button quick reading option and the scan option for quick multiple readings. The readings are accurate and usually with 1-2 yards of being perfect which is good. The build quality seems better than the price point would suggest though it’s not perfect, also it is both water and dust resistant which is definitely an advantage. Another thing I like about this option is it has everything included. Including a strap, a nice carrying case and cloth to clean the lenses. The carrying case also has a latch so you can attach it to the outside of your golf bag which I found quite useful myself. 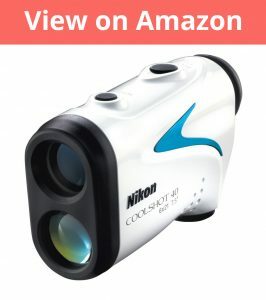 This is a good rangefinder for the more casual golfer or someone who wants to get the most value for their money! This golf rangefinder is not on the radar of lots of people but I was pleasantly surprised, so I had to include it here in my top 5! While this golf range finder may not be the most portable or lightweight option it’s still quite good overall in these areas. Because of being a lower price point the materials on this rangefinder are of lower quality but the functionality I was quite happy with. It’s simple to use with a one button to get the distance straight away or you can use the pin seeker feature which works quite well. 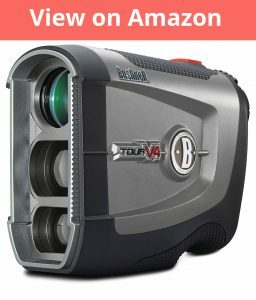 The accuracy of this rangefinder was like the TecTecTec above, it worked constantly well always about right only up to a few yards off which is solid especially considering the price of this rangefinder. It’s worth mentioning that once in a while when trying to lock onto the flag I had problems and I needed multiple attempts for it to work. Though for the most part that didn’t happen too often. This rangefinder comes with an included carrying case which is useful as I store the rangefinder in the same compartment of my bag as my golf balls and tees so that helped keep it protected from damaging them. Bushnell are renowned when it comes to rangefinders, so it’s no surprise to see this product making my top 5. This Tour v4 option the most expensive option in my list but this is a case where paying that little extra is worth considering. 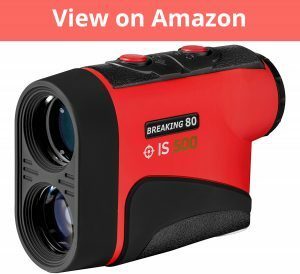 This rangefinder is quite a popular option amongst golfers and I can see why – it offers a nice mix of quality and value for money in one product. The first thing you will notice when using this product is the quality of it. It’s one of the best I have used when it comes to how well it feels in the hand and the materials they have used. A cool feature I really like about this product is the Pin seeker functionality – basically how it works is that you point it towards the pin and once it recognizes the pin it will vibrate along with providing the yardage to the hole. That’s where it “Jolt” name comes from because of the vibration feedback it gives you, which is undoubtedly a handy and unique feature. This pin seeker feature is effective over 400 yards and in my usage even on the longest par 5’s I was always able to lock on easily. The standard Line of sight distance works up to 100 yards range though. The accuracy is amazing and the best in this list. The pin seeker function works 400+ yards and the regular LOS mode works up to 1000 yards. You also have access to a 5x magnification which is useful on occasion. The battery life on this one is very good, it can easily last 12 months with frequent use (2-3 rounds a week) and it’s still on going for me, so you definitely don’t need to worry about battery life with this one! The first thing that I liked about this breaking 80 rangefinder is the simple design and the nice red color. For operation, you have 2 buttons one to measure the distance and the other to range the current mode you are using. The 2 modes that are available are one the standard Line of sight(LOS) mode that measures the direct distance to your target. The other mode is called Flag mode. With flag mode, you should point your target to something near and behind the green ideally, once you have that in your target you should press and hold the power button to get the first reading and then as you are holding the button you move it to point towards the flag. It works relatively well but its isn’t as seamless as some other rangefinders. In terms of accuracy and range it has a maximum range of 550 yards and the accuracy is quite good. In my usage, it was at worst 1-2 yards of the actual distance which for such an inexpensive rangefinder is quite impressive. One thing I didn’t like was that there is no off switch and the device time out seems to be much longer than needed which will undoubtedly drain the battery more quickly. While Nikon are not known for rangefinders and so I was unsure about how this rangefinder would fair. In terms of design this is one of my personal favorites. It looks quite classy and has a nice sturdy build. On the tap of a button you will get access to the distance which only takes half a second which is very fast and responsive. So, you can easily tap it for multiple reading or use the 8 second measurement scanning which as I’m sure you have guessed updates distance continuously for 8 seconds. It’s nice with this rangefinder you have the option to use it how you like and the versatility is great. While Nikon say, the accuracy will be with 2 feet which really isn’t as good as I would have hoped for considering this higher price point. I also had some problems targeting the pin which was a big letdown considering the higher price. It’s also worth mentioning this Nikon also comes with a carrying case so you can put in it your bag without worrying if it could get damaged.